August 8th was an incredible night in Montreal, Canada, as Bishop Michael Kaniecki, SJ joined KNOM General Manager Tom Busch in accepting KNOM�s third straight Gabriel Award as "Radio Station of the Year!" The Gabriel is the most prestigious North American radio and television award for "outstanding artistic achievement...which entertains and enriches with a true vision of humanity and a true vision of life." Another new arrival to Nome, volunteer Kelly Brabec (front left) holds one of our mission�s five previous Gabriels, as do (left to right) volunteers Jodi Engle, Connie Fessel, Vicki Muzik and Kevin Glynn. The Gabriels they�re holding were for "Radio Station of the Year" for the years 1979, 1984, 1987, 1996 and 1997. 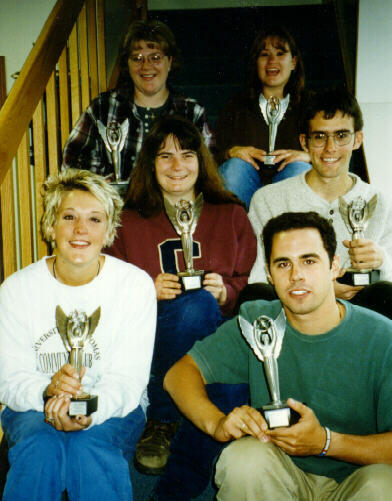 1998 "TV Station of the Year" went to giant WCVB-TV in Boston. Lesser awards in categories such as "Best Public Service Announcement" were presented to NBC News, CBS Productions, WMAQ-TV Chicago, the Canadian Broadcasting Corporation, WMKV Cincinnati, KNX Los Angeles, and WQXR New York, among others. INSPIRATIONAL SPOT: At the heart of silence is prayer. At the heart of prayer is faith. At the heart of faith is life. At the heart of life is service. top Father Mark Hoelsken, SJ (Left) took time out from his Yukon River Delta pastoral work to visit KNOM for two weeks in July. Father Mark, who is pastor for the Eskimo villages of Chefornak, Newtok and Mekoryuk, doubles as KNOM�s Spiritual Director. As you may have read in past issues, he was a volunteer news reporter and engineer for the station before entering the seminary. INSPIRATIONAL SPOT: Let Jesus be in your heart, eternity in your spirit, the world under your feet, the Will of God in your actions, and let the Love of God shine from you. -- St. Catherine of Genoa. top "YOUR STAMP HELPS." Yes, it sure does. As you know, we have found overall that providing a Business Reply Envelope for the convenience of our donors is worth the mission�s while. It makes sending us a contribution easy, especially for those of us who always seem to be out of stamps. The post office charges us 34 cents for each one they deliver. If you add a 32-cent stamp to the envelope, then our cost is reduced to 2 cents. Last year, the savings to the mission totalled $2,851.88, which subsidized about 50% of the total cost of our using Business Reply Mail. We�re happy to pay the postage for our friends who don�t have a stamp handy, but yes, if you do add a stamp, it helps. Thank you! TWENTY-FIVE YEARS AGO: August 1973, according to KNOM news reports, a handful of students from remote Little Diomede Island reported late to high school on the mainland. Rough weather and high seas had prevented the only means of travel � traditional umiaks (small boats covered with walrus skin, pronounced OO-mee-acks). The students eventually made the dangerous crossing after four attempts. DISASTER struck Western Alaska villages in July and August, when so few salmon arrived in many areas that officials were forced to completely shut down entire fisheries. Closing commercial fishing pulled the rug from under thousands of families, for whom it can be their only income. The salmon runs were so weak that across large regions, officials also suspended fishing for personal needs. As you know, a majority of our village listeners depend upon salmon for most of their year�s food. Governor Tony Knowles has declared Western Alaska a disaster area. August 9th, the Red Cross airlifted powdered infant formula to one village to feed 100 infants whose parents were unable to purchase food from the store. Please continue to pray for the many families who are hungry today. (Left) KNOM General Manager Tom Busch was honored in Montreal with the Agnellus Andrew Award, which is the highest Catholic honor that can be accorded a broadcaster worldwide. Created by Unda, the world association of Catholic communicators, the award is named for Glasgow-born Bishop Agnellus Andrew, a pioneer in Catholic communications. It is given to a very few individuals or organizations, and only every four years. 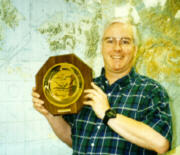 Tom is the only individual in North America to ever receive it. presented to five organizations: in Canada, the Congo, Indonesia, South America and the Philippines. "I was stunned when I learned of it," Tom said. "It obviously speaks to the incredible work of KNOM." At the helm of KNOM since 1975, Tom is a twice-past-president of the Alaska Broadcasters Association and was inducted into their Hall of Fame last year. 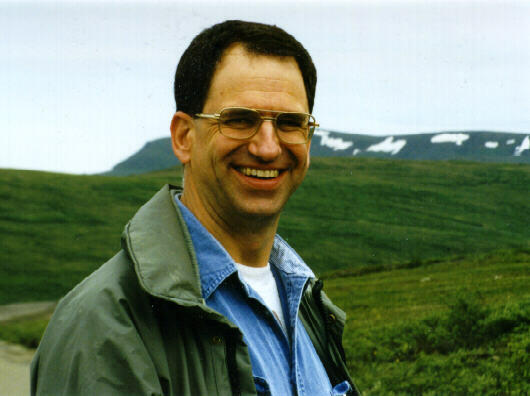 Under his guidance, KNOM has won six "Radio Station of the Year" Gabriels, as well as the National Association of Broadcasters� Crystal Award for Excellence, NAB�s Marconi Award as "Religious Station of the Year," and numerous honors both in Alaska and nationwide. I am not alone, for God is always with me. I am not afraid, for God is protecting me. I am forgiven everything, for God is loving me. I am bearing fruit, for God is supporting me. I will persevere, for God is sustaining me, and I am being saved, for God is calling me. NEEDS: We�re still praying for an "angel" who can subsidize the $16,000 campaign to spread sensitive radios and antenna boosters among our scattered listeners. To get the most of our six hardworking volunteers, we increasingly need what�s known as a "dubbing station," not a full studio, but a corner where programs, music and spots can be edited, and dubbed from CD or tape into our computer system. We�ll locate this dubbing station upstairs in our computer room, and like all of KNOM�s equipment, we�ll buy gear that�s rugged and reliable (and therefore fairly expensive), but not fancy. Once it�s built, we expect that it will be busy for five to eight hours a day. It will free the main studios, which are also very busy, for more elaborate production. 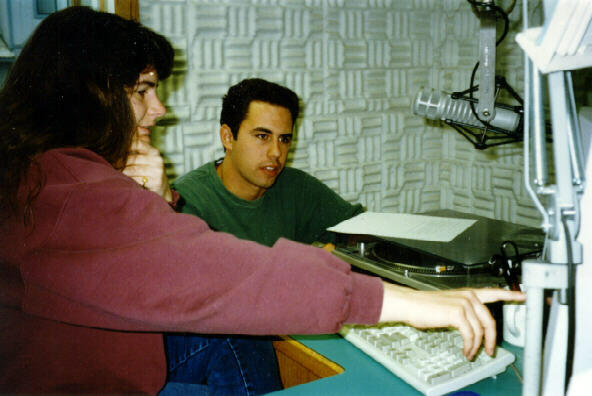 CLASSROOM:(left) Volunteer Connie Fessel instructs Michael Warren in Studio A.
There�s a lot of information to absorb, and you�d be proud to see how quickly our new volunteers pick up the skills of being on the air. INSPIRATIONAL SPOT: If God is your copilot...trade places! 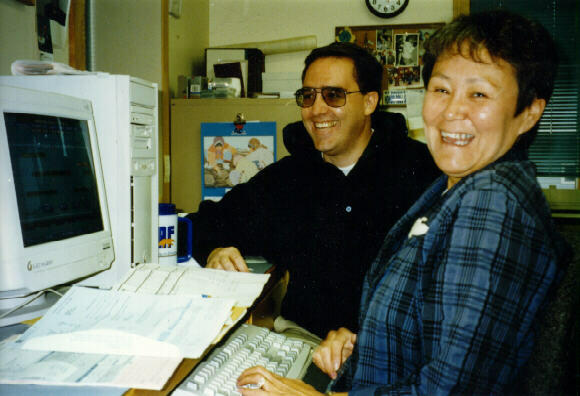 top (Left) It�s not fun closing out the fiscal year, but still, Ross Tozzi and KNOM business manager Florence Busch share a light moment in the upstairs office. Ross is "on loan" from Mount Angel Seminary in Oregon, where he is studying for the priesthood. INSPIRATIONAL SPOT: Instead of fighting fire with fire, try water. top HAPPY BIRTHDAY! August 16th marked one year of operation using our new transmitter. We extend prayerful gratitude to each of you who made that wonderful improvement possible. Thank you for your financial support and your prayers, without which our mission would quickly cease to exist. May God richly bless you for your generosity!